We understand your need for up-to-the-minute data when you need it. Data tools benefit the entire company from executives through to operators. Data can be shared with the click of a button. Data can be stored for up to one year. Asset Science dashboards are designed to provide most of the day-to-day analytics without requiring input. 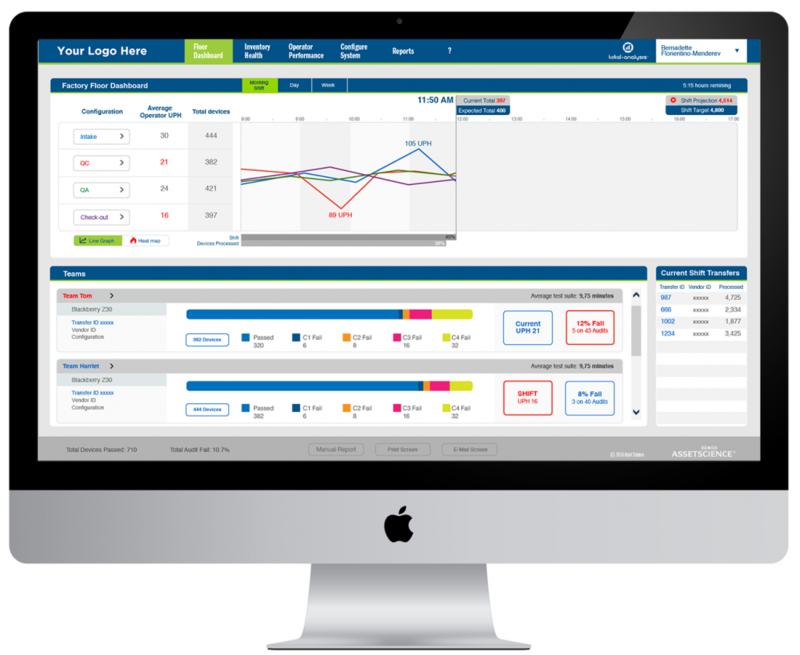 It delivers insight to progress, spots ‘bubbles’ in the pipeline and allows rapid action for any issues, balance loads improve the process and meet targets. Asset Science role-based access dashboards give managers the essential information at a glance. The graphs show trends indicators instantly and will show any production line problems or tendencies. Our dashboards show ‘what you need to know’ in real time performance as well as trends. A manager can drill down to the department, team or operator level. Asset Science Dashboards provide most of the day-to-day analytics, which enables the team leader to monitor operator or team status indicating coaching and problem-solving needs. Data and Reports are easily shared by email or by hardcopy printing. We also provide an ‘ad hoc’ reporting tool to slice-and-dice data for forensic analysis on any subject related to your process. Give your customers the power to test their mobile devices—anytime, anywhere. Whether you want to monitor smartphone health, troubleshoot hardware failures, or conduct appraisals for insurance or buyback, Asset Science’s in-hand solutions can help. Reduce in-store wait times and boost customer satisfaction by diagnosing customer devices in minutes. Conduct on-the-spot buyback or insurance appraisals, and use Asset Science’s data tracking and analysis tools to optimize your operations. Optimize your process with solutions designed to address the challenges of the factory environment. 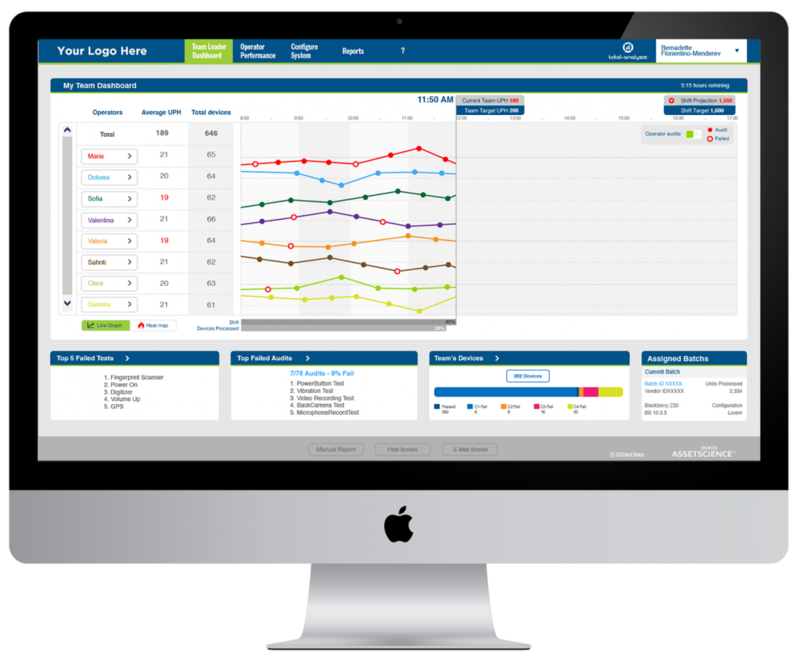 Our real-time data tracking and analysis tools give you unparalleled control over your factory floor, so you can reduce your bounce rate and boost customer satisfaction in the process. Tell us about your business needs. Available In-Hand, In-Store, and In-Factory, our mobile device diagnostic solutions are the most trusted in the industry. We can help you increase test accuracy and boost customer satisfaction.